January 26, 2019. Chartering Anniversary in "De Watermeulen @ Kruibeke. November 30, 2018. Dr José Rizal meets José Marti (Cuba). Lecture by Sir Eddy Verheye (KOR). Place of venue Vredeshuis Ghent, Sint-Magrietstraat 9. More info to follow by Mail. July 21, 2018. Outing to Ieper. More info to follow by mail. Everybody welcome. June 19, 2018. Rizal's Birthday Celebration, Ghent/Brussels. Dresscode KOR Uniform. Place of venue Embassy of the Philippines, Avenue Molière 297, 1050 Brussels. June 15-17, 2018. Trip to Heidelberg. May 26, 2018. Rizal Lecture in het Romerohuis in Puurs. Information and Reservations thru our Chapter Commander Sir Danny Vandenbogaerde (KCR). April 21, 2018. Dear Knights, please join our upcoming Spring activity in Puurs. Program: election 2 board members-presentation by Sir Lucien Spittael and quiz by Sir Lucien Spittael - fraternal dinner-tombola (MC Sir Paul Verloo) and small surprise for one of the participants. 24 euro as of above 14 years, 14 euro between 5-14 years old, 0 euro below. Reservations thru our Chapter Commander Sir Danny Vandenbogaerde (KCR). December 30, 2017. Rizal Day at the Philippine Embassy. More info to follow. October 28, 2017. Rizal Autumn Activity. More info to follow. August 25 to 27, 2017. European KOR Assembly, keep track of your mailbox. All latest news will be send to you by our Chapter Commander. More info to follow. July 21, 2017. Outing Kattendijke, Zweeuws-Vlaanderen, see info in newsletter 49 May 2017. June 19, 2017. Rizal's Birthday Celebration, Ghent/Brussels. April 22, 2017. Rizal Activity in "De Schuur @ Kruibeke". Welcome and bar opens at 5PM and Dinner at 6PM. Tickets and reservations via our Chapter Commander Sir Danny Vandenbogaerde (KCR). September 10, 2016. 125 Year Celebration of the printing of El Filibusterismo in Ghent. Welcome at 10 AM. at restaurant De Abt. Reservations via our Chapter Commander Sir Ronny Felix (KCR). Participation 12€ pp, additional dinner 35€. More info (click here). June 12, 2016. 118th Independence Day Brussels. June 4, 2016. 118th Independence Day Bruges. April 23, 2016. Rizal Activity in "De Schuur @ Kruibeke". Welcome and bar opens at 4PM and Dinner at 6PM. Tickets and reservations via our Chapter Commander Sir Ronny Felix (KCR). More info (click here). December 30, 2015. Rizal Day, Philippine Embassy, Brussels. This year we will celebrate the 119th death anniversary and martyrdom of Dr. Jose P. Rizal and the Centennial Commemoration of the Rizal Monument. December 30, 1896, Dr. Jose Rizal was executed at Bagumbayan. You are kindly invited to a reception that will be held from 6PM on. Thereafter, flower laying ceremony and inspirational speeches will be held. Philippine Embassy, Avenue Molière 297, 1050 Brussels. If you like to join for the fishing trip, please let us know in advance because we have to order the boat. Of course those who are not joining the boat trip can also come. There is place for picknicking and opportunity to collect oysters and creases. But also, please let us know whether you will come! Information and Participation via our Chapter Commander Sir Ronny Felix (KCR). June 19, 2015. Rizal's Birthday Celebration, small ceremony is foreseen in Ghent, Henegouwenstraat and will take place at 2.30pm. The ceremony in Brussels, Philippine Embassy Brussels will start at 5PM. June 14, 2015. 117th Independence Day Bruges. April 11, 2015. Rizal Activity in "De Schuur @ Kruibeke". Welcome and bar opens at 4PM and Dinner at 7PM. Tickets and reservations via our Chapter Commander Sir Ronny Felix (KCR). More info see newsletter. December 30, 2014. Rizal Day, Philippine Embassy, Brussels. This year we will celebrate the 118th death anniversary and martyrdom of Dr. Jose P. Rizal and the Centennial Commemoration of the Rizal Monument. December 30, 1896, Dr. Jose Rizal was executed at Bagumbayan. You are kindly invited to a reception that will be held from 3PM on. Thereafter, flower laying ceremony and inspirational speeches will be held. Philippine Embassy, Avenue Molière 297, 1050 Brussels. August 28 to 31, 2014. 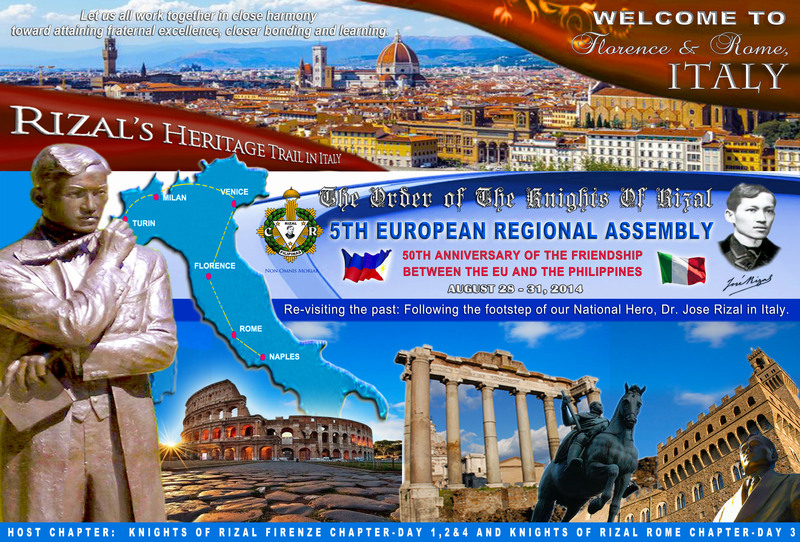 Invitation to the Order of the Knights of Rizal 5th European Regional Assembly. Via San Gallo, Firenze, Italy. participation form and send it back or please address all the correspondence to the address below. passport numbers to help us facilitate some bureaucratic process of the said event for visa, hotel accomodation etc. together, we enthusiastically welcome you to Florence and Rome with our warm regards. June 15, 2014. 116th Independence Day Brussels. For the flyer (click here). June 7, 2014. Dear Brother Knights, please find the invitation of our brothers from Aalst, just confirm your presence with our Chapter Commander Sir Paul Verloo (KCR). solid and always in action for the sake of Brotherhood. April 6, 2014. Rizal Activity in "De Schuur @ Kruibeke". Welcome and bar opens at 4PM and Dinner at 7PM. Tickets and reservations via our Chapter Commander Sir Paul Verloo (KCR). More info will follow. January 25, 2014. 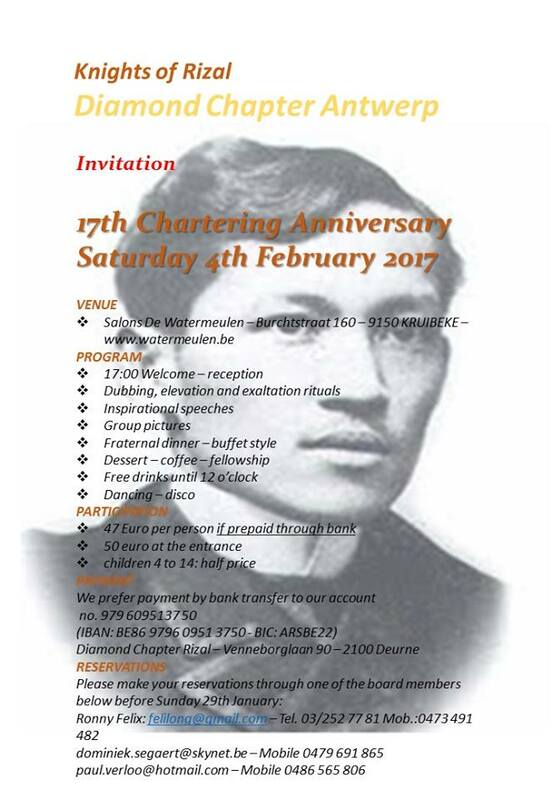 14th Chartering Anniversary in "De Watermeulen @ Kruibeke". Dubbing of new Knights, elevation KOR, exaltation KCR, Rizal program, dinner, dancing. Reservations thru our Chapter Commander Sir Paul Verloo (KCR). Payments : 60€/person for the aperitif and world buffet including drinks until 11.30PM. December 30, 2013. Rizal Day, Philippine Embassy, Brussels. This year we will celebrate the 117th death anniversary and martyrdom of Dr. Jose P. Rizal and the Centennial Commemoration of the Rizal Monument. December 30, 1896, Dr. Jose Rizal was executed at Bagumbayan. You are kindly invited to a reception that will be held from 4 till 5PM. Thereafter, flower laying ceremony and inspirational speeches will be held. Philippine Embassy, Avenue Molière 297, 1050 Brussels. October 19, 2013. Rizal Activity in “De Schuur @ Kruibeke". Welcome and bar opens at 4PM and Dinner at 7PM. Tickets and reservations via our Chapter Commander Sir Paul Verloo (KCR). Payments : 22€/Adult and 12€/Child (6-12 years) - Beverage at democratic prices. Place to be : de Schuur, Broekdam-Noord 47, 9150 Kruibeke. Hope to meet you there. June 21, 2013. Knights of Rizal, Belgian Area fund raising. The order of the Knights of Rizal, Belgium cordially invites you to an evening of Music Featuring OPM and International Pop songs in the A Cappella Manila Chorale Arrangement-“Pop-A-Pella”. On their 5th European Goodwill Tour. 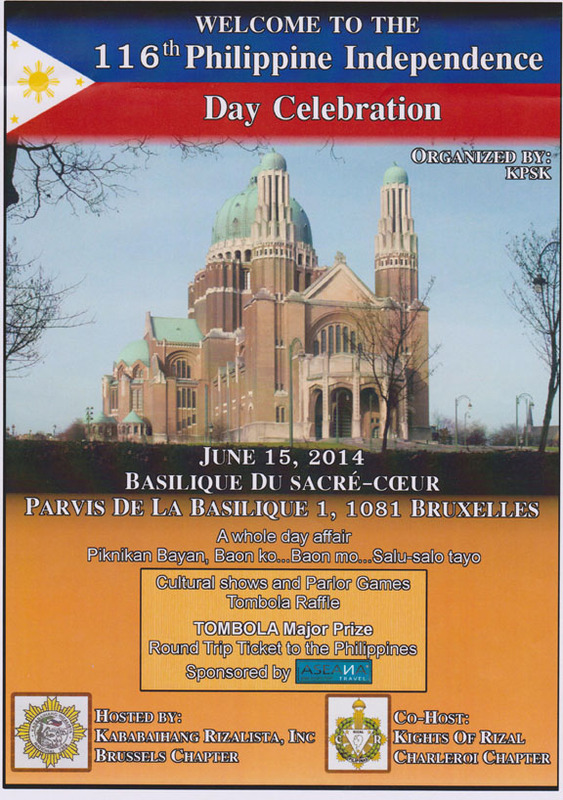 On Friday 21, June 2013 at 19hrs, St. Remi Church, Rue Michel Zwaab 5, 1080 Molenbeek-St Jean. For the benefit of our Youth Program-Scholarship for the Elementary School Students and Calamity Victims in the Philippines, and Books for the Rizalian Library. Join our board members and let's together back up this joyful event for (a) good cause(s). Chapter Commander Sir Paul Verloo (KCR). June 19, 2013. Rizal's Birthday Celebration in the Philippine Embassy Brussels. June 16, 2013. Independence Day Brussels. May 23, 2013. Sir Reghis Romero II, KGCR, supreme commander, together with Supreme Trustees Sirs Diosdado Santos, KGOR, and Carlos Arnaldo, KGOR, Sir Mark Boado, KR and Lady Judy Savares, President of the Kababaihang Rizalista of Angeles City will arrive in Brussels around noontime. In the afternoon, a courtesy call to the Philippine Embassy and a sightseeing tour in Brussels is planned. May 24, 2013. Small ceremonies, including flower offerings, first at the marker in Brussels, later similar activities at the marker in Ghent. Sightseeing in Ghent, perhaps also short visit to Bruges. 18:30: Assembly with ceremonies, probably in Mariott Courtyard Hotel in Elsene. Participation fee, approx. 55 euro. Dress code: Barong Rizal for the official parts. Reservation for the evening is a must. Partners also welcome. Read here our Chapter Commander's speech. "Rizal in the Modern World". May 25, 2013. Diamond Chapter will organize a full day visit to Antwerp, including lunch and diner. May 26, 2013. The company will travel to Paris. For more information or participation please contact our Chapter Commander Sir Paul Verloo (KCR). April 13, 2013. Dr. Rizal Garden Party. Fund raising party. Starts at 4PM. In the garden of Sir Peter De Bruyn and his wife Lady Lieve. Aperitief, cold and warm spring buffet and deserts. Small Quiz. Participation fee 25€. For reservation, payment and more information contact our Chapter Commander Sir Paul Verloo (KCR). January 26, 2013. 13th Chartering Anniversary in "De Watermeulen @ Kruibeke". Dubbing of new Knights, elevation KOR, exaltation KCR, Rizal program, dinner, dancing. December 30, 2012. Rizal Day, Philippine Embassy, Brussels. Our Chapter Commander Sir Paul Verloo gave an amazing speech. (read more). March 31, 2012. Our yearly Rizal activity followed by a BBQ in "De Schuur @ Kruibeke". June 12, 2011. 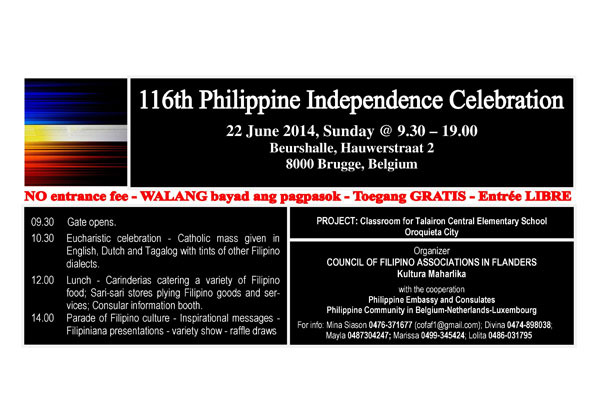 Philippine Independence Day Celebrations in Brussels, Brugge & Torhout.